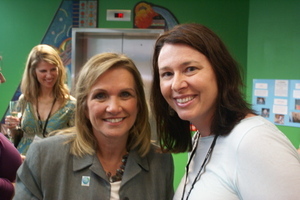 Thank you Stefania for this lovely photo of me with Elizabeth Edwards at the BlogHer07 party this past weekend. What a thrill to meet her--amazing woman. On being attacked on the Internet and the media: "My experience of trolls; they don't go away if you ignore them. The same thing is true of Ann Coulter." On stating her views, even when they differ from the campaign's: "No one's ever asked me to stop talking." On Hillary Clinton and the Defense of Marriage Act: "She's in favor of repealing some of it. John and I are in favor of repealing all of it." On universal healthcare: "The national will is there. But to pay for it we're going to have to raise taxes." On Hillary Clinton: "If you say as a woman you should support me, then you should lead on the issues that are important to women." On youth involvement in politics and community work: "I think one of the reasons young people are not involved is that they feel powerless, and that their voice will not be heard...I think it's part of the jobs of campaigns--wherever they are on the spectrum--to hand young people a megaphone." On Iraq as a women's issue: "Iraq is a women's issue...I bet in 2004 I did not have a single event where a woman didn't cry in my arms for the loss of their child, or in fear for their child. I think if women were in charge there would be no more wars." On the politics of war: "I was once at a fundraising event when the the audience was asked who among them had a relative who was serving in Iraq, and not one of the guests raised their hand--but all of the people who were serving raised their hands." On the politics of media: "John has said that he does not want Rupert Murdoch to be the gatekeeper of the information that Americans receive." More on Rupert Murdoch: "I don't agree with Rupert Murdoch. I agree with me all the time. But I still don't think I should be the sieve through which all information flows." On where she gets her news: "I turn on the BBC. I don't want to hear 90 seconds on an issue. I want to hear it fully discussed." On self-expression: "I think people dye their hair purple because they want to be noticed in a very crowded world." On campaigning in Texas: "I'd like John to go to Texas and campaign against Rudy Giuliani." On how her faith informs her political views: "I believe that we are given a set of guidelines and that we are obligated to live our lives with a view to those guidelines....not because of the promise of eternal life, but because it is right." Anyone want to join me in nominating Mrs. Edwards as a write-in candidate for 2008? Photo courtesy of Stefania Pomponi Butler at Citymama. And thanks to Robyn and Glennia for filling in a few quotes I missed. I'm live-blogging this session for the benefit of my mom-blog-writer friends who I KNOW have a book in them--you know who you are. It's 10:15 on Saturday and I'm in a room with about 100 other women curious about how to turn their blogs into a book. The panelists are Denise Wakeman, founding member of The Blog Squad, writer and editor Ariel Meadow Stallings, Lifehacker founder Gina Trapani and ICM literary agent Kate Lee. Kate represents a number of bloggers--she started out as an assistant trying to find clients, and through them, her niche. She began by contacting people she'd met online, and it spread virally at the beginning. She's looking for voice--unique and compelling voice. She's also looking for traffic, and, finally, ideas and concept--something fresh and new that hasn't been out there before. So, how important is it to have a blog? Kate says "it's a no-brainer"--for marketing and for connecting directly with your audience. Most publishers want you to have a Web page so there are at least links to Amazon, B&N and Borders. Ariel and Gina talked about how having a blog has helped them market their books. Gina included the traffic stats, etc in the book proposal. Lifehacker is a Gawker Media blog, so Gina had the ability to build traffic that way. "So I wasn't touched by God. I was touched by Nick Denton." She had a mention in the NYT the day her blog launched. Ariel's personal blog is Electrolicious, which inspired her first book Offbeat Bride: Taffeta-Free Alternatives for Independent Brides. Another question: if your work is posted on a blog, is it considered previously published for the book trade? No, but you might just run into a problem of whether there's new material that's not freely available online. Gina said that she did run into that issue with her book--her publisher wanted exclusive content, so it was a "delicate dance" to work it all out.